This is the second and the last part of Intraday Trading in Stock Market topic. If you have NOT watched the first part go now watch it first you will NOT understand what I am going to talk in this video unless you watch and understand Part-1 first. I am assuming you have already seen and understood what I have said in the 1st part of this topic. In this post I am going to talk about Intraday trading with a mix of non-intraday trading. You must be thinking. What is non-intraday trading? Well, it is normal trading. Let’s say I have bought 100 shares of Reliance for ₹1,000 on 01-01-2016. Now, I sold 10 shares of Reliance on the same day for ₹150. And sold the remaining 90 shares of Reliance for ₹850 on 04-04-2016. This means for 10 shares it is intraday trading and for remaining 90 shares it is normal trading. So, how the entry will be passed in Tally? We have to divide the entry into two entries. We have to create 2 entries. One for Intraday Trading and another for Regular Trading. Please note that the profit or loss will automatically be calculated in the profit and loss account. First of all we will pass the entry for purchasing the 100 shares of Reliance as I have said above in the example. But, here is a small twist. We will pass the entry only for 90 shares because for 10 shares we are doing intraday trading. And in intraday trading, we do not pass the entry with the stocks in it. We just pass the entry for the expenses and the brokerage. Let’s first pass the entry for 90 shares of Reliance which are for delivery at the price of ₹10 per share. Here are the steps. Select Journal or simply press F7 which is the shortcut for Journal. Then pass the entry as shown in the picture below for purchasing 90 shares of Reliance. For the sake of simplicity, I have not passed the brokerage entry here, but you can do it and I have explained it in the first part of Intraday Trading in Tally. As you can clearly see, there are 90 shares of Reliance because we are doing intraday for the other 10 shares. So, this entry is the first part of the intraday with normal trading included. At the end, press Enter and your entry is done. Now we will pass the entries for the remaining 10 shares of Reliance which we have sold at a profit of ₹50 per share. Again, please note that we have sold the 10 shares on the same day on which we have purchased them and that is why it is intraday. Now, let us quickly jump into the entry. Here are the exact steps to create it. Select Journal or simply press F7 for the shortcut. Now, we will pass the entry as shown in the picture below. You can also write a narration for the entry so if in future you see the entry, you will know that what intraday trading entry this is about. Here is the narration I wrote for the above entry. And finally when you press Enter you will have passed the entry. This was the intraday trading entry without entering any stocks because there is actually no need of it. Now, we will pass the sales entry for the 90 shares of Reliance which we have just bought in this post. I will be selling them at loss, so you can see how you can pass the entries for even a loss in the stock markets. By the way, I have had many losses before finally get profitable in the stock markets. Let’s get into the entry right now. Here is the step by step process. Again, select Journal or press F7. Now look at the image below and pass the entry for selling 90 shares of Reliance at a loss of ₹50, so in total it would be ₹850. So, as you can see, I have bought the shares at ₹900 in total and I have sold the same at ₹850 with a ₹50 loss. I have not included stock broker just for simplicity. I have explained that in the previous post. You can go ahead and check that out. Press Enter to save the entry and you are done. We have in total passed 3 entries in this post. One for buying the shares for delivery. Second for selling the shares that we have purchased for delivery. Thus its effects can be easily seen in the Profit and Loss Account. Go to the Profit and Loss Account from Gateway of Tally and you will easily see its effects. In this post, I have passed the entries considering Stock Market trading as a business and not investment. Let us see the effects in the picture below. Just ignore everything except where you read the share word. You can clearly see the the bought out shares on the Debit Side of the Profit and Loss Account as Share Purchases and the Share Sales on the Credit Side similarly. You will also see Intraday Profit and Loss under the head Direct Incomes on the Credit Side of the Profit and Loss Account. If it were a loss in Intraday Trading, it would be under Direct Expenses or a negative figure under the head Direct Incomes. Although in this post, we have a loss, but because of previous entries, we have a profit. To know the previous entries, please read the previous post. Thank you Aneesh for asking such a good question. A good enough question that made me create two posts as well as two informative videos about just intraday trading in Tally. 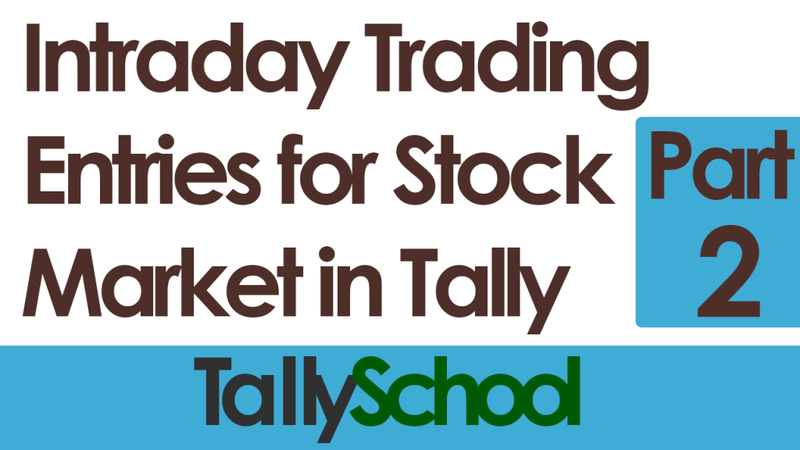 I am sure you people have understood how to create intraday trading entries for stock market in Tally. If you have any problem or question regarding the entries, comment down below and I will be happy answering them. And lastly SHARE this. It will help others as well as me. So don’t hesitate to SHARE. Sharing is Caring.